Florida adoption laws and forms for Step-Parent Adoption, Adult Adoption, Adoption by Close Relative and Agency Adoption information in Florida. The laws surrounding the different types of adoptions are far from comprehensive. As new situations arise and a trend is seen in courts throughout the state, Florida statutes continue to become more comprehensive in attempting to address a larger range of situations than the direct laws on adoption itself. Many questions regarding rights of the mother and father, grandparent’s rights, medical issues, fraud, and a plethora of individual issues often arise in Florida courts and Florida adoption laws. The Florida Adoption Act: Chapter 63 of Florida statutes, titled the Florida Adoption Act, attempts to address as many of these questions as possible in order to make adoption cases easier for both people and the courts. Many of the issues that arise in an adoption case come from questions dealing with the father and mother. In the cases where children are involved, the Florida adoption law states that written consent must be given from the mother and father. In rare cases, a child may be taken from a parent or parents when the court deems it necessary. This information is covered in Chapter 39 of Florida statutes, but is still addressed in Florida adoption law. Essentially the law gives courts to the ability to remove parental rights when situations in Chapter 39 are met. Another of the many questions that arises stems from children that are surrendered or left at a hospital. If a child is left at a hospital or other agency, the child is given to an adoption agency and the agency will seek a legal court order for emergency custody until a good home can be found. At the same time, the Florida adoption law also states that any child surrendered will be investigated by the local law enforcement agencies. As far as adoption paperwork goes, parental rights are surrendered with the child. An unmarried biological father can gain custody of a child, but they must make a claim of paternity before a termination of rights claim is made. If a father does this, he is subject to DNA testing to prove he is the father of the child in question. In addition, for a father to gain custody of a child already placed with adoptive parents, the father must prove he has a substantial relationship with the child, has taken some responsibility for the child, and according to the law has demonstrated a full commitment to the responsibilities of parenthood. This commitment includes regular visits to the child and maintaining regular communication with the child. Other questions that often arise surround the rights of grandparents. If a child lives with a grandparent for at least six months within a 2-year period immediately preceding the filing of a petition for termination of parental rights, an adoption entity will give notice to the grandparent of a hearing on an adoption petition. This is applied unless the child loses their parent(s) and something different is stated in a will. This situation also does not apply where a stepparent adopts a child. Otherwise, a grandparent may adopt a grandchild in accordance with the general Florida adoption laws, just as anyone else would make a claim. They do have more rights because they are a relative, but any custody changes still need to be approved by the court. For current parents and parents thinking of adopting, the law requires that adoptive agencies must provide a written disclosure statement. This statement must be given within 14 days and includes the person(s) inquiring about adoption and the parent of the child in question if they can be located. This statement is given to anyone seeking information from the adoption agency regarding the possible adoption of his or her child. The idea behind this process is to let the actual parents of the child come forward and stop any adoption paperwork. An adoption entity must report to the court about any intended placement of a child where the placement is not with a relative or stepparent. If an adoption entity places a child in a home before parental rights are terminated then it is considered an at-risk placement because the child could be removed if parents seek to regain or instate their rights over the child. In addition to this process, under Florida adoption law, an adoption entity is required to do a preliminary home study and the actual study must be done by a licensed child-placing agency. The idea of a home study is to ensure that a home is fit for a new child to live in. Criminal records, an interview with prospective parents, assessment of the physical environment, counseling, and education, are reviewed, and a signed disclosure is all part of a home study. As you can see from reading the above information contained in the Florida statutes, the laws are not all encompassing, but they do attempt to address any major issues. No matter what role you are considering in an adoption, consult chapter 63 of the Florida statutes, speak with an attorney, or gain the help of a document-preparing agency before tackling personal adoption problems. The law allows the court quite a bit of room to make decisions on adoptions, so being prepared is the best way to enter this situation. The Self Help Guides' Florida Family Adoptions includes updated information, new custom forms, and the processes & procedures you will need to adopt an extended family member in Florida. Suitable for Grandparents, Stepparents, Aunts & Uncles, and Cousins who would like to adopt a child or children related by blood. 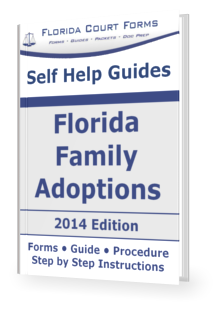 This self help guide includes interactive forms, sample adoption petitions, and instructions on how to successfully complete a Family Adoption in Florida. The Self Help Guide includes easy to follow step by step instructions, all the required & supporting forms, filing procedures & checklists, proven forms not found anywhere else, easy to understand and written in plain English.